He who controls the Internet is the cause for all online disruption around the globe, including ISIS. It is that simple. The debate of who is at root fault for the globe's chaos is moot. The United Nations and ICANN are at fault. And President Bill Clinton. Clinton set the wheels in motion to deliver the U.S. taxpayer funded military net out of American control to Switzerland. The military internet started under ARPA, then DARPA. The tech genius' working on it were boys playing with expensive toys the taxpayer paid for, back in the 1980's with money, in 2015, with privacy and instability. To them it was games, after all they were men with an unlimited pocketbook to pay for. The cost? None to them. It was win-win, notoriety and money. There is no conscience to people without accountability. A decade plus later, the chickens have come to roost. It is revealed that President Bill Clinton's plan to set into play turning control of the Internet over to the United Nations is coincidental in dates to occasions the world would not bat an eyelash at, then. Days after international financials markets technology is being puppeteered by invisible persons, the timeline came in to focus. Coincidences shared by Bill Clinton, the United Nations and the fate of the global internet. Four numbers, 1-9-9-7. A date, a year, the fate of the world swings for worse. 1997 (9/15) domain google.com was registered. 1997 Clinton gave a medal to Cerf , a member of U.S. P.I.T.A.C. The United Nations is a business league, nothing more, and a lot less. The United Nations is a business league with an agenda, a league of uber wealthy people playing a game of consequences, a political truth and dare. The web adress advertises the United Nations to be a non profit. The I.R.S. has no record of a non profit called the United Nations registered with it. America took control of the Internet, on the outside. On the inside, the sitting President Bill Clinton, in 1997, was setting up a "friends with benefits" advantage. Other root servers had their TLD's infringed by ICANN, without accountability. The Deparment of Commerce, who has oversight of ICANN, renewed ICANN's contract annually without putting the IANA contract out for competitive bid. 2014, the Department of Treasury, OFAC, Office of Foreign Assets Control gave Iran back its internet facilitating Iran's access to the Darknet and global money transfer via SWIFT, the international money transfer system based in Europe. Vint Cerf's personal wealth reportedly grew to over $43 million. Cerf, credited as being the father of the Internet worked for telecom company MCI Worldcom in 1999 as Cerf testified to Congress on ICANN advancement. President Bill Clinton said ICANN was to be a non-profit, not making more money that it needed. ICANN is reporting in 2013 over $400,000. In 1999, projections were that ICANN would exceed trillions in valuations. Along the way, the SWIFT network made their money system Shariah compliant. SWIFT is a business league with member financial institutions around the world. In 1997, the United Nations working with IANA editor Jon Postel adressed .ps . (dot)ps is the Country Code that was assigned for 'Palestine', calling it a "special status." In 1997, the conversations between Dr. Postel and the United Nations stated the .ps was for the "Occupied" Palestine territories. "The United Nations had country code designations on a list called the ISO list. The ISO table is referred to as the authorative reference of which ccTLDs, country code Top Level domains, are designated. The ICANN report states, "sovereignty and nationhood are not among the IANA's function." 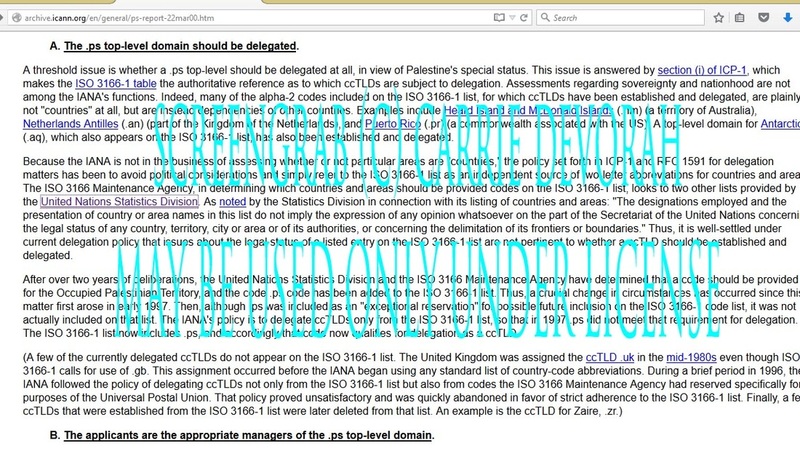 The ICANN report continues, "because the IANA is not in the business of assessing whether or not particular areas are "countries" the the policy set forth in ICP-1 and RFC 1591 for delegation matters has been to avoid political considerations and simply refer to the ISO 3166-1 list as an independent source of 2-letter abbreviations for countries and areas." "After over two years of deliberations, the United Nations Statistics Division and the ISO 3166 Maintenance Agency have determined that a code should be provided for the Occupied Palestinian Territory and the code .ps code has been added to the ISO 3166-1 list. Thus, a crucial change in circumstances has occurred since the matter first rose in early 1997. Then although .ps was excluded as an "exceptional reservation" for possible future inclusion on the ISO 3166-1 code list, it was not actually included on that list. The IANA's policy from the ISO 3166-1 list so that in 1997 .ps did not meet that requirement for delegation. The ISO-3166-1 list now includes .ps and accordingly that code now qualifies for delegation as a ccTLD." 2004, it was a Saudi plane that flew President Clinton, Google execs and a few select others out to Davos. New York is a one-party kinda town, make that a "one-party consent" law town. It is criminal to record an “in-person or telephone conversation unless one party to the conversation consents,” N.Y. Penal Law §§ 250.00, 250.05. Which means if you decide to perform a sting in New York state against maybe Planned Parenthood and a StemExpress doctor gushing about Crunchy baby fetal baby parts, you are good to point, click “record” and shoot, that is presuming the video was shot in New York. Each state has its own rules for recording. StemExpress is a Placerville, California “…multi-million dollar company that supplies human blood, tissue products, primary cells and other clinical specimens to biomedical researchers.” StemExpress says “Our human tissue products range from fetal to adult and healthy to diseased...” Ironically considering the brouha, StemExpress is listed #35 on Inc 5000 of Inc’s Fastest-Growing Women-Led Private Companies in America. StemExpress’ 2013 revenue was $2.2 million. StemExpress CEO is Cate Dyer. The listing states that StemExpress “supplies biomedical researchers with human blood, tissue products, bone marrow, primary cells, and the clinical specimens they need to perform their research. The circulated viral videos of StemExpress doctors awoke people to Planned Parenthood’s practice of custom sales of baby fetal parts, domestically. Nothing has been said about Planned Parenthood’s international reach or about Planned Parenthood’s filed Form 990’s Schedule F, Foreign Forms. Those government forms tell another part of the Planned Parenthood international story, listing the non-profit’s grants given to Sub-Saharan Africa, Central America Caribbean, South America. Planned Parenthoods Form 990’s describe their international relationships are about Reproductive Health, monies moved with wire transfers. Contraceptive supplies are moved, too. The other ‘more’ to Planned Parenthood’s international story is IPPF. IPPF is International Planned Parenthood Federation. Planned Parenthood Federation of America, PPFA, is a non-profit. Planned Parenthood Federation of America is the largest affiliated part of IPPF International Planned Parenthood Federation. Planned Parenthood Federation of America collaborates with the United Nations Development Program aka UNDP, the United Nations Children's Fund aka UNICEF, the United Nations Population Fund aka UNFPA, the Organization for Economic Co-operation and Development aka OECD and WHO, the World Health Organization. IPPF is PPFA’s European arm in association with the United Nations. Congressman Randy Forbes has been raising question as to the United Nations. Planned Parenthood is another arrow in Congressman Forbe’s get-rid of the UN. The International Planned Parenthood Federation was organized 1946, in Stockholm Sweden by the Riksforbundet for Sexuell Upplysning; 1948, the International Congress on Population and World Resources in Relation to the Family was held in Chelthenham, England; and since. The International Planned Parenthood Federation was formed in 1952, in Bombay India. Planned Parenthood was started in 1914, in America. The US affiliate of IPPF, Planned Parenthood, in 1942. The movement in America began when three women challenged existing Comstock laws. Comstock laws cracked down on mail distribution of lewd, obscene or lascivious publications. The women, Emma Goldman, Mary Dennett and Margaret Sanger distributed their leaflets on self-induced abortions and childbirth concerns. Sanger sent out her newsletter on contraception called “The Woman Rebel.” Sanger had set out to break the law. Instead, she broke the glass ceiling of women’s rights. IPPF has since grown to more than 149 Member Associations operating in more than 189 countries. IPPF is now located in London, England. IPPF is funded through the European Commission, the United Nations Population Fund for special projects, through governments, trusts, foundations. and from government official development aid programs. Planned Parenthood said it was going to adress child health services, maternal and reproductive health care. Planned Parenthood expanded it’s causes. Planned Parent involved itself in policy. Planned Parenthood Action Fund, Inc. was set up to lobby for the non-profit’s publicized interests. Somehow, selling baby fetal parts had not managed to infiltrate Planned Parenthood’s conversations, that is until…. The StemExpress undercover videos exposed Planned Parenthood’s downplayed covert activities. There is a wrinkle or two for Planned Parenthood. The I.R.S. requires all non-profits to state their mission statement correctly in the annually filed Form 990. Transacting in stocks and investments as donations has compliance requirements, too. As it is, selling fetal tissue and body parts is not stated on Planned Parenthood’s Form 990. Guidestar.org shows 202 Planned Parenthood sites filing Form 990s, 7 in New York. New York State Department of Corporations lists 18, Planned Parenthoods. The Schedule O addresses Board responsibility, not Mission Statement. Planned Parenthood declares on it’s filed I.R.S. Form 990 that the non-profit does grant giving to foreign countries, including Africa. Selling body parts is a problem in Africa just like selling body parts is a problem in America. Trafficking in body parts and tissues is taboo yet it is done. StemExpress states on its sites that it’s clients “donate” their body part. This would beggar the notion that Planned Parenthood had its clients sign Fetal Tissue and/or Parts contracts with it’s clients that Planned Parenthood then passed forward to StemExpress. That said, StemExpress’ website says it seeks donors of wholeblood, bone marrow, maternal blood and white blood cells. A search for “fetal tissues” donations comes back “No Hits.” StemExpress says on it’s site that StemExpress gives its donors a $25 to $250 gift card. A $25 to $250 gift card to Planned Parenthood for each fetal donation adds up to more than chump change for Planned Parenthood. No clarification is that “people across the globe” may be the U.N. programs funded government agencies in the U.K. and elsewhere. Planned Parenthood solicits a donation alternative to cash. Planned Parenthood solicits donations of stocks and investments, advising the donor to “instruct your broker or bank to call 800-430-4907 to speak with someone on our donor services team or if you hold the physical securities, you can directly mail or hand deliver the certificate(s) without any endorsement or assignment to the address below” at 434 West 33rd Street, New York, New York 10001. Donors are told to enclose a cover letter that states the purpose of the Donors gift “(for example, "to benefit all of the national programs of PPFA"). And in a separate envelope, please include a signed stock power form for each gift. (Please note that except for your signature exactly as your name appears on the stock certificate, the stock power form should be blank)” along with a Stock Power form. Some of the Planned Parenthood affiliates tell the Donors which investment advisor firm to work the donation through. Planned Parenthood Federation of America’s International Program is headquartered in New York with 40 staff based in the U.S., Latin America, and Africa. The International regional offices are located in Nairobi, Kenya, and Miami, Florida. Planned Parenthood Federation of America says it co-founded the International Planned Parenthood Federation. Women made choices based upon Planned Parenthood's representations. The question is would Donors and women have made the decision they did if Planned Parenthood had told them their fetus would become Medical Sushi. Deception is not a good thing. It invites ingestigation, in this case, international investigation. The IRS tax tip states, “If your goal is a legitimate tax deduction, then you must be giving to a qualified organization. Also, you cannot deduct contributions made to specific individuals, political organizations and candidates,” IRS Publication 526, Charitable Contributions, for rules on what constitutes a qualified organization. With Congress calling for heads to roll at the I.R.S., Congress may realize, through the Planned Parenthood travesty, there is a value to the I.R.S. that trusts until notified otherwise, that submitted tax papers are truthful.